Tomorrow marks the beginning of the eight-day Jewish festival of Hanukkah. According to tradition, during the rededication of the Holy Temple (the Second Temple) in Jerusalem at the time of the Maccabean revolt, a small quantity of oil used to light the Temple's menorah somehow miraculously burned for eight days. Hanukkah commemorates this event. Traditional menorahs did not use candles, they used oil. According to an Israeli archaeologist, the oil was most certainly olive oil. As Dr. Rafael Frankel explained, "In the Hebrew Bible, in the Old Testament in several places it speaks of pure-beaten olive oil for the light. Olive oil was the main oil of this region and very little other oil was ever used." You can still buy oil menorahs or adapt an existing menorah for oil. 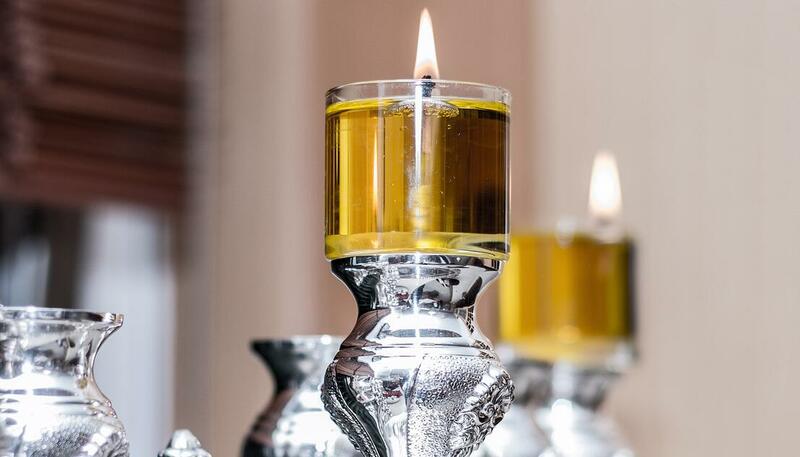 This year, try olive oil instead of candles in your menorah. * Tip: You can make latkes with extra virgin olive oil or you can use olive oil (sometimes marked as "classic" or "pure" olive oil). Olive oil contains a mixture of refined and extra virgin olive oil and is an economical choice for frying.